"Dots Attack 2" by 'kingrex1' - A wonderfully simple but addictive (and rather difficult game) demonstrating that games don't have to be complicated or have fancy graphics to be fun. "SpeedBall" by 'LDC27' - Nice Mechanics give a polished feel to this game. It's short on levels (which left us wanting more and we look forward to seeing this game develop further). "Asteroids Classic!" by 'KelianNZ' - Good clean graphics and game-play including thrust and hyperspace and simple sound effects make this a nice tribute to the classic game. 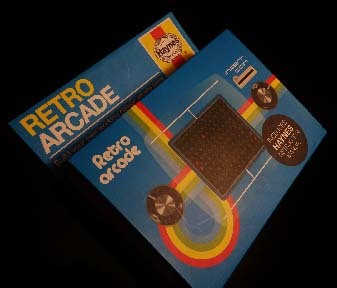 The programmers above will all receive a 'Retro Arcade' pong kit. "Air Attack" by HarryPotterMouse100 - Reminiscent of vertical scroller games like '1942' - The game plays well with a soundtrack that matches the game nicely - it was very much a contender for our top three. Great work. "Escape the Room" by 'kingrex1' - A difficult but addictive game with good mechanics and again, nice clean simple graphics. This would have likely made it into our top three had kingrex1's other game not already been selected. We look forward to seeing other works by kindrex1 in the future. "Survivor 2" by 'loui4' - This game shows potential - There has clearly been a lot of work gone into creating it and with a bit more polishing (and perhaps reducing the maximum number of sprites on the screen) it will be great to play. "Luffy" by '123qwe123qwe' - It's not a game, instead something that could be built on by other people. We like that - it's what we're about; sharing skills, knowledge and ideas. "dead man zapdos" by 'zapdos111222333' - A good attempt at Asteroids with nice movement and cool stars. "doom on the broom" by 'OBi0330' - A fun, colourful game with a great title and nice sound. "Space" by 'Minecraftfourme' - Another good attempt at the classic Asteroids game, and with a touch of humor. The Arcade 2.0 has now finished, and while it has been a silly amount of work, we're really going to miss it. We will miss the reactions of the children as they walk into the 'Johnny Cash' room at NMIT. We'll miss reminiscing with people who share an interest in retro games. We'll miss working together on our simple, silly projects. We'll miss trying to find orange balls from around the room at the end of the day. We'll miss the squeals of laughter as people try and play games from their childhood (and remember just how difficult they were). This project started years ago and this two weeks has been just a small snapshot of the work that has gone into creating The Arcade 2.0. It's nod to all the creators out there who's journey to a finished work is largely unrecognized. When a painting is put on a gallery wall for example, it could be the result of many years of work and the only survivor of numerous rejected ideas or drafts. This project is also very much about people and the contribution they make to our community. We've (again) asked an enormous amount of our family and friends, particularly over the last few months and we'd like to say a thank you in particular to our partners, Ros Pochin​ and and Nicki Hobden​, for supporting the project and putting up with us. A Very big thank you to Fiona Gillespie from NMIT for organising the spaces for the Arcade Project and Nick Haig for allowing us to use G-Space Gallery - without this support and that of everybody in the Creative Industries department, we would not have been able to hold the event. Similarly, without Faye Wulff​, Karl Wulff​ and Mark Soperman​ from Community Art Works, we wouldn't have been able to put together the projects for the event. Many of the projects were developed at, and with help of the people at, Community Art Works​. Thanks to the children at CoderDojo Nelson NZ​, Aidan Curran​ and the other volunteers that help put them together. Alison Abernethy, Megan Pochin​, Natasha Pochin​, Alan P. T.